Hi there! 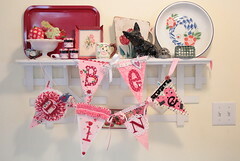 You're here at the "i" on the Be Mine Banner Swap Blog Hop! I was so exited to be included in this great swap. You can find links to all the instructions at the end of this post! (1) 2" x 3" red for letter i. Please note, if you don't have decorative shears of rotary cutting blades, straight cuts will be just fine! Cut out your felt using a decorative rotary cutter OR decorative shears. Trace your smaller banner piece and letter "i" onto fusible web. Fuse to the respective fabric pieces and cut out. Fuse your pink banner centering it on the felt piece. Fuse your "i" in place low on the pink inner banner piece about 1 1/2 inches from the tip. 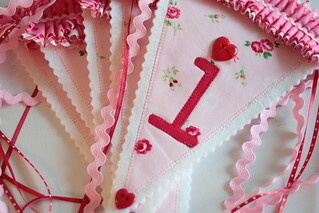 Machine blanket stitch the pink banner piece and the letter "i". If you don't have blanket stitch capability on your machine you can straight stitch around the edges or stitch by hand! Be a rebel, it's a banner, you don' t even have to stitch if you don't want to! 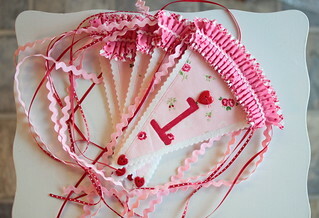 Stitch your ruffle along the top of the banner piece centering your ruffled stitch line on the top of the pink banner piece. Your ruffle should show about 3/4 of an inch above the felt piece. 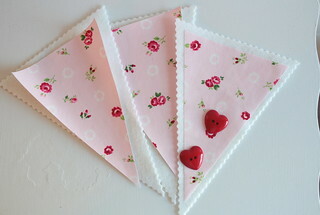 Trim the side edges even with the banner side edge, using decorative shears or rotary cutter. Topstitch mini rick rack on the stitching line. I tied my buttons on with a knot leaving ties using red Aurifil 30wt thread. You could also use embroidery thread or perle cotton. I hand stitched ribbon and rick rack ties to the back of the banner. But those eyelets that others have used look like the best idea ever! Here's a picture of the full banner taken by Roseann!!! It's adorable, right? And here's mine at my house! So cheerful! Here's the list of swappers, where you can find instruction on how to make each of the of the letter's in "Be Mine". thank you SO MUCH for my awesome "I"!!! SMOOCH! Meow! I am so glad we swapped...you are amazing and I love everything you do...thanks bunches for my letter...you rock! Super cute Pam. Suzanne is the big winner, her M is fabu! SO cute PKM! I love your sweet little I. And how fun to be in a swap with such a great group! Sew cute, Pam. Your "i" is great. I love ruffles. Such a sweet project from all you ladies. A lot of talent there. It was fun seeing how each of them was made. Happy Valentines Day! !